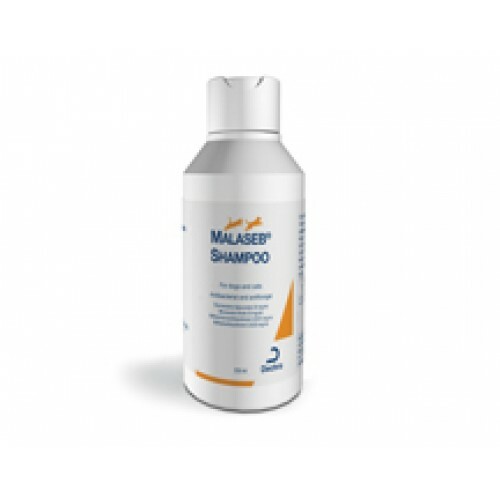 Malaseb Shampoo 250ml; Malaseb Shampoo is a unique combination of antibacterial and antifungal agents with coat conditioners. It is formulated to help with dandruff, ringworm, yeast, and other bacterial infections. 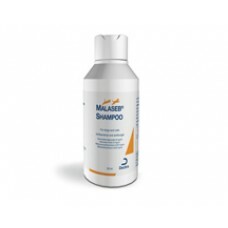 Malaseb Shampoo is ideal for general or multifocal therapy of dermatitis in dogs, cats and horses. Malaseb is free from dyes and perfumes to prevent a possible worsening of skin problems and its innovative surfactant base removes damaged lipids without harming the skin. This synergistic formulation removes scales, degreases the skin and kills cutaneous microorganisms that cause primary or secondary dermatitis. Malaseb Shampoo contains Miconazole - an antifungal agent with activity against fungi and yeast - and Chlorhexidine Gluconate - a proven antimicrobial agent against gram-positive and gram-negative bacteria. To assist in the control and treatment of tinea (ringworm) caused by Microsporum canis in conjunction with griseofulvin. In general, apply twice weekly until symptoms subside. Then once a week or as needed. Apply twice weekly for 6-10 weeks. Or until the skin has no more traces of Microsporum canis. The shampoo should be used maximum of 16 weeks .. Wet coat thoroughly with water. Apply and lather Malaseb® Shampoo over the entire body, allowing 10 minutes of contact time. Rinse completely with water. Do not allow the animal to lick while bathing to prevent ingestion. Repeat twice weekly until symptoms subside, then weekly, or as directed by your veterinarian. A 250ml bottle is usually enough for 8-16 treatments of a dog weighing 15kg or 25kg for 5-10 treatments of a serious dog or a cat for 25 treatments (depending on the fur density).